I’ve ranted about unwelcome insects invading our home before. The springtime culprits are cluster flies. This time of year, it’s exotic Asian Lady Beetles, Harmonia axyridis (Coleoptera: Coccinellidae). 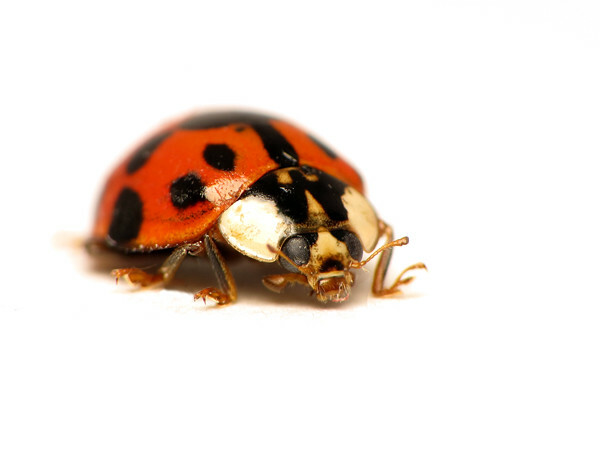 They were introduced to North America in the 1970’s to control aphid populations and are now one of the most widespread lady beetle species in Canada, due to their winter-hardiness and reproductive rate. They make nuisances of themselves at light sources (*bonk* *whap* bonk*), poop on the walls, AND they bite. No seriously, they bite. The cats will chase but not eat them, because they’re reflex bleeders that exude stinky, foul-tasting hemolymph as a form of chemical defense. I guess they’re sort of pretty though. Sigh. One other (kinda neat) thing about this species is the enormous variability is displays in terms of colour, pattern and shape. This individual, for example, is one of the smaller, and redder specimens I’ve ever come across. The number and size of spots can vary, the dominant color can range from black to red…it’s a tough one to ID sometimes! However, the prothorax (between the head and the wings) holds the most reliable clue. If you look at the black pattern (which is surrounded by large white areas on either side) you’ll note that it forms the shape of the letter “W”, or “M”, if you’re looking at it the other way. This character is pretty consistent regardless of what the rest of the body is doing, color-wise! In order to recapture the smell of lady beetles, I’ve always felt you should lick your finger, then run it across the bottom of a dirty ashtray. It is, indeed, a distinctive aroma. The folks at the “Lost Ladybug Project” are doing a neat job of mapping the distribution of these little beetles. Nice “citizen science project” at http://www.lostladybug.org. Second: that’s a great project! Thanks for sharing the link!